“This award is special to me be­cause there are other players out there who do well on the rugby field and I’m surprise to get the award." Fiji rugby 7s female player of the year winner Lavenia Tinai during the FRU Awards night at the GPH Suva on February 9,2019.Photo:Simione Haravanua. It was a pleasant surprise for Fiji Airways Fijiana rep Lave­nia Tinai when she was named the Fiji Rugby 7s Player of the Year (Female) on Friday. “This award is special to me be­cause there are other players out there who do well on the rugby field and I’m surprise to get the award. “I was not even expecting this since there were other senior play­ers like Ana Maria Roqica and Rusila Nagasau nominated,” she said. The Wailotua, Wainibuka, na­tive believes her inner strength is always driving her on the field of play. “When I run onto the field of play I always make sure that I perform my level best in all areas in defence and attack and always do my family and country proud. “This award is special to me and my family and I know all the strug­gles I went through trying to get my spot in the Fijiana spot has finally materialised,” she added. Tinai made her debut in 2012 and she was selected to represent Fiji at the 2016 Olympic Games in Rio. “To all women out there, if you think you have what it takes to be a rugby player come out and prove yourselves,” Tinai said. 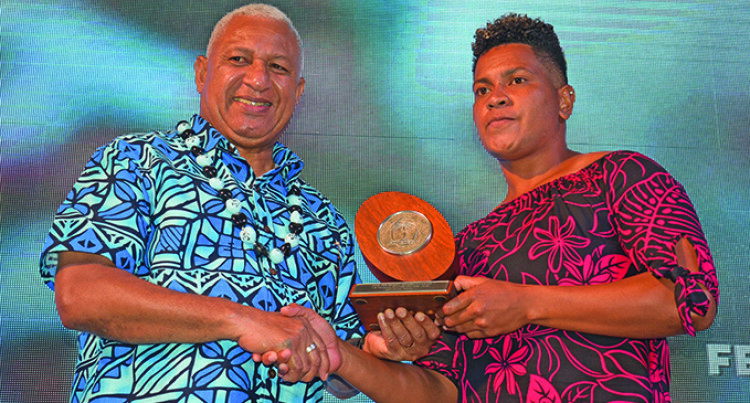 Hard work and dedication finally paid off for Fiji Airways Fijian 7s rep Vilimoni Botitu after receiving the Fiji Rugby Under-20 Player of the Year award. “I’m so thankful to God and the support of my family receiving this award. If it wasn’t for them I wouldn’t be receiving this award,” Botitu said. Following his performance in the second leg of the World Rugby Sev­ens Series in Hamilton, Sydney, the Korobebe, Nadi, native hopes to im­prove his defence. “After the Sydney 7s I saw that de­fence was my weakness so that will be my main focus,” he added. Fiji Airways Fijiana rep Lave­nia TinaiFiji Rugby 7s Player of the YearRusila Nagasau.